Google Trips APK 0.0.29 will keep you away from getting lost. As a travelling application for your Android device, Google has made a very handy application. Of course, this is not fresh news as everyone knows Google has been doing their job in making an application that is different from the rest. Although Google Trips is still on a test for its release, many people wish for some innovations and uniqueness from Google. Because the test will take a while, people will have to guess what Google has in store within this app. However, despite not being announced officially, screenshots about this application has leaked and revealed its functions and features in the nutshell. Care to find out? Obviously, this application is meant for avid travellers who love to travel to the unknown. 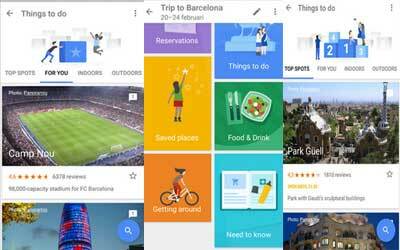 As an application from Google, Google Trips will prioritize its users to utilize their Gmail effectively. After all, it uses your Gmail address to track down every flight bookings and hotel reservations that you are looking for. Furthermore, the app will sort the list and simplify it to enables you to get the flight time and hotel address quickly and effectively. This is a very handy feature which allows you to diminish the constant e-mails arrival from different sources. Certainly, Google Trips has some other things for you. For a clever application, it will display every detail about the locale around you including restaurants, hotels, public transportations, and such. All the information stored within app is purely sent from the locale townsfolk themselves. No wonder the test will take a while to finish. Once the application is fully functional, it will act as the representation of the locales, showing you an array of information, tips, and reviews regarding the local environment around you. Clearly, this shows how effective and life-saving Google Trips for Android can be. Your travel reservations are automatically gathered from Gmail and organized for you into individual trips. Each trip contains your Reservations, Things to Do, Food and Drink, and more. See and download your flight, hotel, rental car, and restaurant bookings in one place without having to search for them individually. Every trip also contains ideas for things to do, automatically organized into categories, like Most Popular from historic visit data, what’s Indoors vs. Outdoors to account for weather, and customized suggestions under For You based on your search history. Once you arrive at your destination we’ll also help you surface what’s nearby and timely. Find out when you’re near attractions – from popular landmarks to local coffee bars – plus whether they’re open and if they’re busy.